Vulture at the Wheel Tesla will launch the Model X tonight. This is the third model the company has launched after the Lotus-built roadster and the amazing Model S.
As a minivan with three rows of seats to fit seven adults, it’s a big deal for the US market, and has “Falcon” as opposed to “gullwing” doors. Falcons being much cooler than gulls, obviously. The X is based on the same chassis as the S, but Tesla has been so good at evolving the S it would be a surprise if there were no surprises. Not least because the Model X is already two years late, after Elon Musk said that it wouldn't ship until it was ready. That insistence doesn’t however seem to extend to the “special” seats, which were planned to fold completely flat. Musk has made lots of comments on the seats, but a leak on one of the Tesla forums from a disgruntled ex-employee from a seat manufacturer claims they will not be ready in time, and only the third row will fold flat. Tesla said that as a new kid, it had problems with sourcing components from automotive suppliers, but now the marque is established it has more clout and can specify what it wants to buy more tightly. This is expected to be reflected in the Model X. The new car is higher and consequently less aerodynamic than the Model S, accounting for a five per cent performance hit, so expect the top-of-the-S-range 90kW battery as standard, and there might even be something bigger. Also expect Tesla to have taken the opportunity to upgrade its autopilot hardware. The Nvidia X1 processor used extensively throughout the Model S has a lot more camera inputs than have been employed by any car manufacturer to date. LIDAR (the remote sensing technology using lasers and reflected light) is probably still too expensive for a production car. Recent developments in diffraction tech will bring LIDAR costs down, but that’s still at the lab stage. Self-driving Teslas are not that far away, so the Model X may well be equipped with this roadmap in mind. Also, expect a bigger screen. 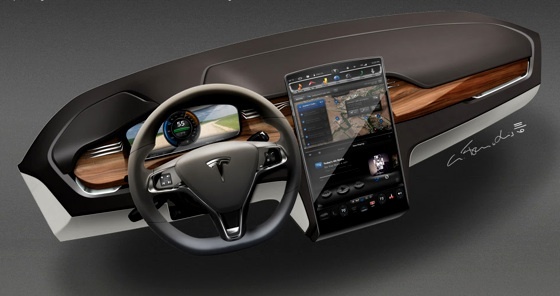 The 17” display in the Model S dominates the dash, but bigger is always better. Model X concepts showed 19” and 21” screens on a stalk, but that wouldn’t pass crash testing, so if the screen is bigger it will be integrated.